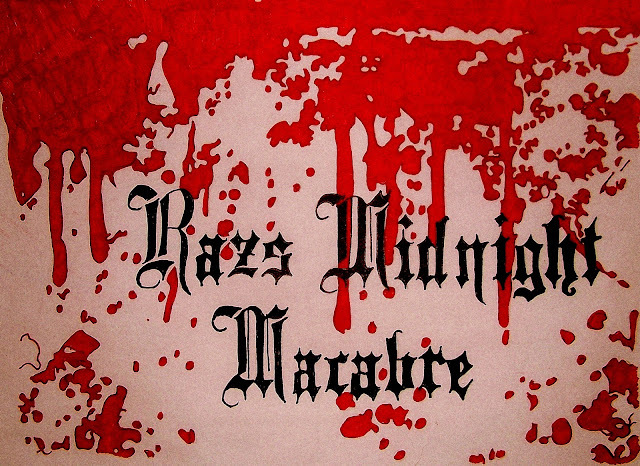 Raz's Midnight Macabre: Raz's Midnight Macabre: What's New? As you can see there are 2 highlighted areas, the top left is a button for those of you that use Pinterest, also you'll notice that the full post does not appear any-more, which brings me to the bottom right highlight, now you have the choice to continue reading the piece if you wish to and you'll see it looks a-lot better on the homepage. Another change is this new bar at the left hand side of the page, this has replaced the chunky box at the bottom each post which used Facebook only. You can still use the Facebook like & share buttons but now you can also Tweet it, G+ it, Digg it and also submit it to StumbleUpon. For a replacement for the fan page button I am now using this nifty little box on the right hand side of the page, it's easier to find and more simple than the last box. At the bottom right hand corner you will now find this nifty little button, it's only use is to take you straight back to the top of the page. Yes it's simple and not really new but it's a little addition to the page. Also at the bottom is the new page navigation bar, before you could only view one previous page, now you have more of a choice and it makes the navigation system easier as blog pieces continue. When you are reading a piece and get to the bottom of the page, this little box will slide out of the bottom right corner recommending past pieces that you may enjoy reading aswell. That's it for now, I didn't want to be too drastic with my changes, just wanted to make some improvements. The only other changes you may notice is a new font for the heading of each piece. I also went back over my past pieces and fixed any problems there was and also did a few updates to some pieces that fell a bit short. There may be a few bugs in the works but none that I have noticed so far, if you notice one please bring it to my attention, thank you. One last thing I wish to ask you is that if you haven't signed up-to the page already then please do, it's VERY quick and easy to do. Just look at the the photo below to see where you sign up. I hope you continue to enjoy my work and I hope you like the updates to the page.